LOVE has delighted and perplexed audiences since its debut in the mid-1960s. SAN ANTONIO, TX.- The McNay Art Museum today announced that ​a​ Robert Indiana LOVE sculpture, a 6 x 6 x 3 iconic example of Pop art, is now part of the Museums permanent collection. 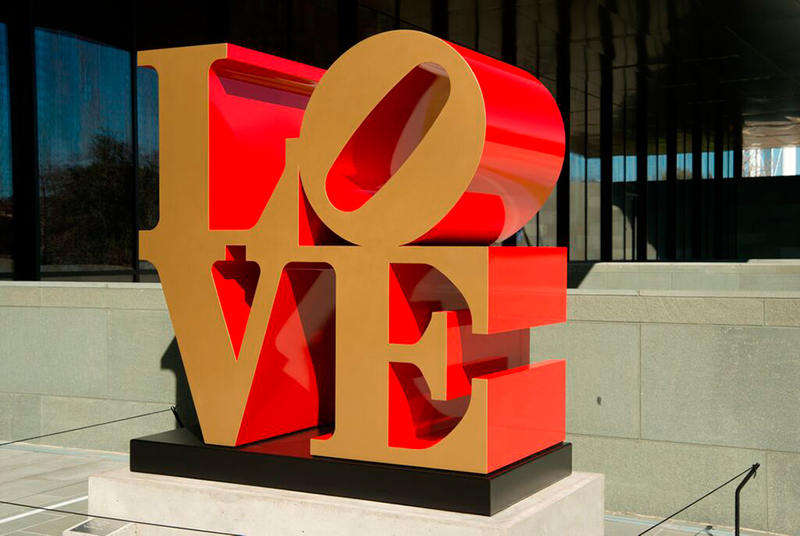 Constructed from red and gold polychrome aluminum, the sculpture ​- one from a series of six-​was installed on temporary loan on the Museums Brown Foundation Sculpture Terrace in March of 2014 as part of the exhibition Robert Indiana: Beyond LOVE. Since then, the sculpture has become a visitor favorite and a popular site for selfies and group photos. LOVE has delighted and perplexed audiences since its debut in the mid-1960s. Commissioned by the Museum of Modern Art, New York, as a Christmas card, the original LOVE was an image in chromatically bold red, green, and blue. The work catapulted Pop art master Robert Indiana to international fame. The countercultural free love movement instantly embraced LOVE, but the works outsider status didnt last long. While generations of audiences have responded to the images immediate positivity, LOVEs staying power is tethered to Indianas prodigious skill and the inherent mystery of his message. The ubiquity of the word love, wry tilt of the O, and bold color combination invite numerous, often contradictory, interpretations. The first LOVE sculpture was created in 1970 for the Indianapolis Museum of Art, Indiana, and a number of additional sculptures, including the one now owned by the McNay, followed. Today, the instantly recognizable image has been translated into several languages and sculptures are installed at locations around the world. In addition to marking a key addition to the Museums collection, the McNays acquisition of LOVE also serves as a fitting ode to the late art collector, philanthropist, and patron Robert L.B. Tobin, Indianas friend and a beloved benefactor of the McNay. Robert Indiana (b. 1928) grew up in Indianapolis, Indiana. He attended the School of the Art Institute of Chicago before moving to New York City. While Indiana found a home in New Yorks thriving art scene, he changed his given surname of Clark to Indiana as homage to his Midwestern roots. Along with 1960s contemporaries Andy Warhol, Roy Lichtenstein, James Rosenquist, and Claes Oldenburg, Indiana co-opted the lettering, imagery, and vernacular used in advertising and consumer culture to create high art that addressed the complexity of the human experience. He is a Pop art pioneer, renowned for the hard edges and boldness of his sculptures, paintings, and prints. Now 87 years old, Indiana lives in Maine.